Opera Turbo for Windows 10 - Web browser with traffic compression technology. The application includes an express panel for clicking on the saved links. Provides multi-loading files in the background, supports modern standards of web graphics, plug-in integration, management through voice commands. The browser is able to compress network traffic and graphic elements, uses the cloud cache to speed up the loading of pages, can turn off the display of images, flash and gif animations. Does not affect encryption protocols, retains basic markup, supports setting up scripts for connecting turbo mode. 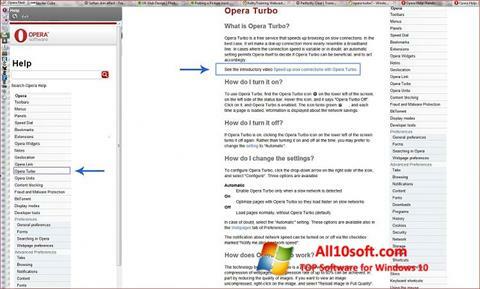 You can free download Opera Turbo official latest version for Windows 10 in English.